From the ambiental point of view, Nicaragua can be divided into three big regions: Pacific, Central and Atlantic. 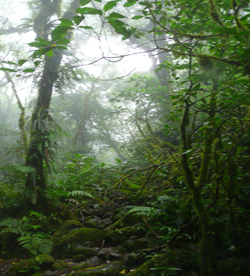 Pacific region is crossed by a chain of big volcanoes and is caracterized by lakes, low altitude dry tropical forest and fog forests on highter places. It also includes the Pacific beaches with white sand. In the Central region prevails over mountain system, exuberant vegetation, rivers, agricultural and cattle areas. The Atlantic region starts with low altitude rainforest going down towards the Caribbean sea where there are marine lagoons, mangrove systems, white beaches and coral reefs. Dry tropical forest, dry savannah and swamps. Rich in precolombian archaelogical sites and birds. Pristine rainforest. Rivers and marine grasses. You can find Manatees and a wide range of wildlife species.